Our window has been painted! 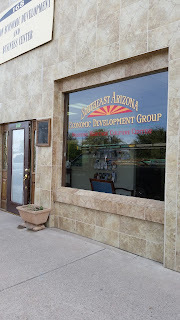 It looks great and includes both Southeast Arizona Economic Development Group and the Western Heritage Cultural Center. Improvements are continuing...Membership is growing. Our Networking luncheon went great. Our window has been painted. Western Heritage has now included another video on the Kiosk. The Chamber has a new inside sign. Come in and take a look! As Benson continues into a new time we have many visitors interested in moving to the area. SAEDG provides consulting for Members which includes information on the availability of commercial real estate, things that are needed by the city of Benson and any other economic development information needed by businesses interested in locating to Benson or other towns in Southeast Arizona. Become a Member or rent one of our spacious cubicles which includes an Associate Level Membership, use of the conference room, luncheons, newsletters, special tours and more!